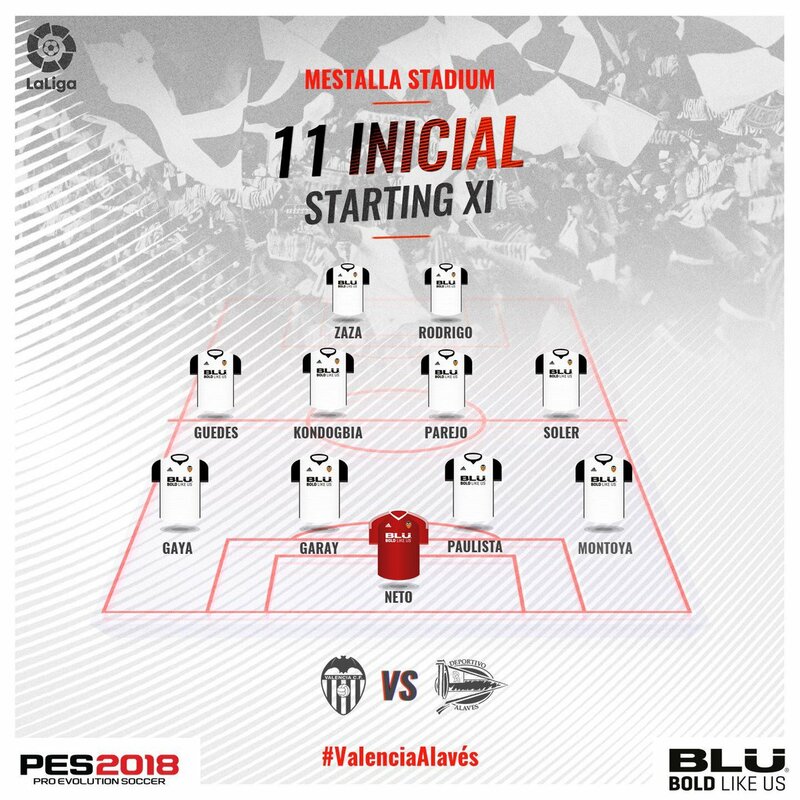 Leading up to this game there were a few worries that Valencia might take their foot off the pedal a bit, after securing an 11-point lead over Sevilla last weekend. On the contrary, the team produced an excellent display, including a first half that's a contender for the best of this season. Blowing Alaves away with a terrific display of football. 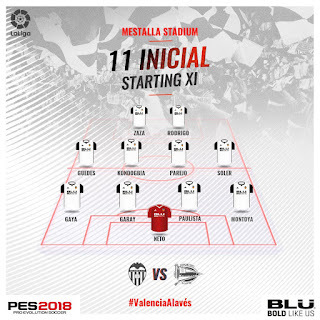 There were no surprises in the line-up, with Mina injured, it's Zaza and Rodrigo up front, the usual midfield four, Gaya, Garay and Gabriel ever present and Montoya returning at right back. Some people may have expected Murillo to partner Garay instead, but it's clear that Marcelino counts on Gabriel. Only Parejo has started more games for us this season and since the start of November, Gabriel has only missed one league game for which he's been available. 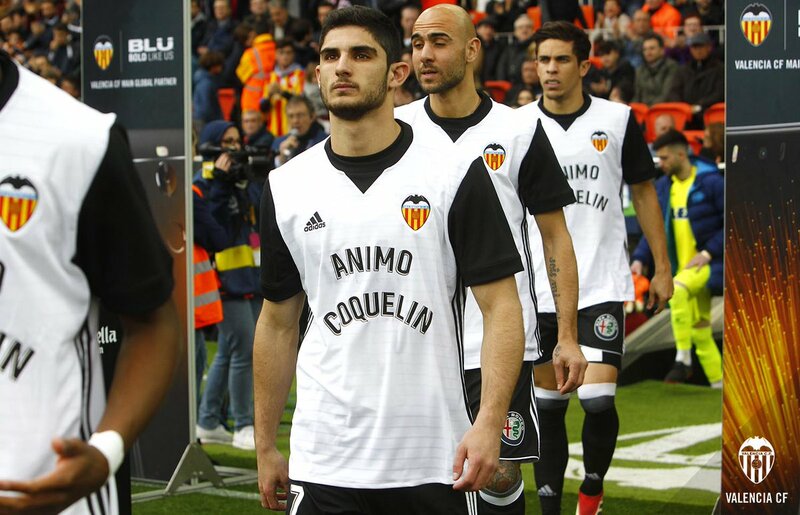 The players came out wearing t-shirts in honour of Coquelin, whose injury means he may be out for 5 or 6 months. It was a nice show of support from them. 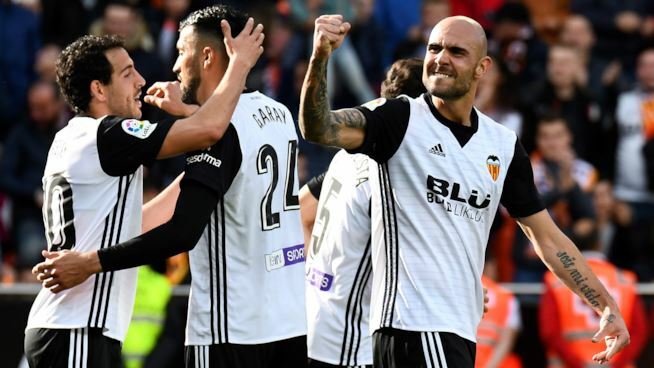 Valencia quickly took control of the game and pressed Alaves hard. After the opening 10 minutes, during which we were generally feeling out their defence, we nearly fell behind. Parejo lost the ball in the middle and the resulting centre produced a great save from Neto from a diving header. After that wake up call, Valencia really stepped up. Pacheco had to produce a super save to rival Neto's after a move finished with Parejo hitting a strong shot. A few minutes later he couldn't do anything to stop us going ahead. Parejo found Rodrigo and the link up and one-two he produced with Zaza was great to watch. Great assist from Zaza and confident finish. Alaves couldn't do a lot after that. They crossed the halfway line a few times, but were quickly dispossessed and subjected to another of the waves of Valencia attacks. Garay just headed wide from a corner. Guedes shot just over then was involved in a good move, picking up the runs of Soler and Montoya in space, but miscommunication resulted in them getting in each other's way. Zaza then added the second, sending a good cross from a free kick from Parejo past the keeper. Valencia finished the half on top, but were unable to add the killer third. Just before the half ended Guedes controlled well and hit one of his trademark strong shots from outside the area. The keeper saved it, then brought down Soler who had been quickest to follow up, but the referee fluffed it, waving away appeals for a clear penalty. Garay had picked up an injury and was subbed for Murillo at half time. To their credit Valencia came out in the second half not happy to sit back, continuing to push for the third goal. It nearly proved costly as Alaves pulled one back. Gaya misjudged a long ball and the defence were stretched with the pull back allowing Sobrino to fire home. Kondogbia, having a great game as ever, had a chance shortly after, using his strength to create space for himself, but then shooting well over after doing the hard part. Alaves had another dangerous counter attack soon after that, finding themselves 2 attackers versus 2 defenders, but failed to convert. After that nervy start to the second period, Valencia put the game to bed. Guedes found Soler in space on the right and he crossed towards the lurking Rodrigo, resulting in the Alaves defender putting the ball in his own net. The fourth just didn't come, despite the team trying. Guedes put an excellent cross to Zaza at the back post but the defender managed to get there first. Alaves were forced to rely on an uncharacteristic mistake for their second chance. Neto mishit a pass, but Sobrino's attempted chip was just off target. Montoya came close to adding a fourth late on, trying to surprise Pacheco with a strong shot and hitting it well, but the keeper produced a good save. Rodrigo and Parejo were subbed off towards the end, presumably to keep them fresher for possible international duty and the game ended with a comfortable and confident win. Alaves weren't bad, but we were far superior and should have won by more. Overall, Coquelin's injury has been the only negative this week. Parejo finally gets called up to the Spain squad and hopefully he and Rodrigo can produce the goods for them next weekend. Sevilla qualifying for the Champions league quarter finals is bad in that it gives a rival more cash, but it also gives them two more games to distract them. Similarly, Valencia stand to receive 5 million from the Andre Gomes transfer if Barcelona win the Champs league. Fourth place looks locked in now, so the team's targets are probably pipping Real Madrid for third and beating the record total of 77 points achieved under Benitez in 2004 and Nuno in 2015. Montoya 7 - decent and confident performance in both defence and attack. I'd like to see Marcelino stick with him for the rest of the season for this position as it isn't good for Soler to constantly have different faces behind him on that side. 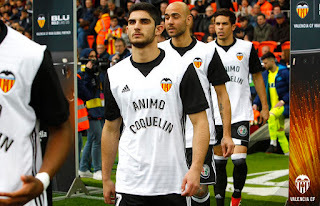 Guedes 8 - strong game, with constant involvement in the attack. Maybe tries to do too much at times. Will be a big loss at the end of the season if he's not signed and that still looks unlikely for cost reasons. Zaza 8 - best game of 2018 so far. All the negatives that we've thrown at him in recent months were absent today. No silly diving or dissent. Accurate passes, good work rate and movement off the ball. Needs to maintain this. Rodrigo 9 - has hit a brilliant run of form. Was a constant threat and key link up player between the midfield and attack and his growing confidence was plain to see.